The old man who Branded Old Monk is no more. Old Monk, the name is enough for the craziness of rum lovers which is the largest loved dark rum brand in both domestic and foreign countries. This rum was produced by Mohan Meakin Pvt. Ltd situated in Ghaziabad, Uttar Pradesh from early 1960s. In 1855 a brewery was settled up to produce cheap beers for the British soldiers. Then the brewery changed from hand to hand and finally became as a distillery named as Mohan Meakin pvt.ltd. The distillery was owned by Kabil Mohan an Ex. Army Brigadier. He introduced the Dark rum into the market in 1954 named as 'Old Monk'. The brand takes it own place in the hearts of rum lovers and in the army's heart too. Before Old Monk, Hercules rum was provided in the army. But after the introduction of old monk brand it pulled the market totally by its side and crowned as a King of Rum brands. The Old Monk is branded as the biggest Indian made Foreign Liquor of the market for many years. Its affordable prize for its customers gave a big hand for its success. Old Monk was known to be sold around eight million bottles annually once. But the biggest success of the brand which proved Indians are not weak in the production of alcohol is mainly by its loyalty to its customers. Many brands have pocket in and out of the market but Old Monk still makes the crown in the heart of its customers. Kabil Mohan who made excellent rum was a Teetotaler, after knowing this it will surely make everyone surprised on him. He was awarded with Padmashree award by the Indian government in 2010. Unfortunately the Classic rum brewer had gone sick last year even though he was taken good care by his family. He passed away on last Saturday (06.01.2018) by a cardiac arrest at his home situated in Ghaziabad. 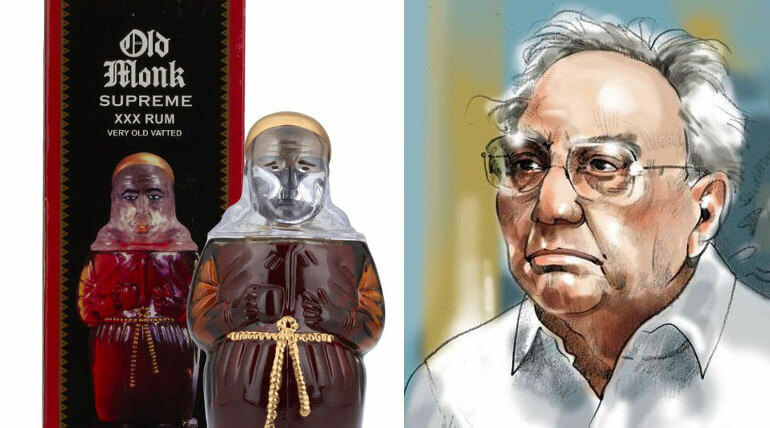 Kabil Mohan who provided a dark liquid ecstasy filled in a fat little monk bottle will always remains in hearts of all his brand lovers.